Yellingham Farm is the perfect place to stay for an authentic countryside experience. A cosy and relaxing home away from home, all our guests are given a flavour of what it’s like to stay on a small working farm, which is still farmed traditionally, with sheep and cattle grazing naturally all year round, hay making in the summer and lambing in the spring. We keep two breeds of sheep – the very colourful, parkland Jacob which produces stunning wool for our range of woollen products and the hardy Black Welsh Mountain who produce the most beautiful lambs and subsequent flavoursome meat. Shearing is also a great spectacle to enjoy, but importantly a pleasure for the ewes to don their coats for the summer months ahead. You can meander and watch the cows and calves gently grazing and ewes and lambs enjoying the sunshine. You can also collect the eggs from our mixed crew of free-range chickens! The River Tale forms one of the boundaries of the farm and is wonderful to walk along and provides reasonable fishing if you have plenty of time! 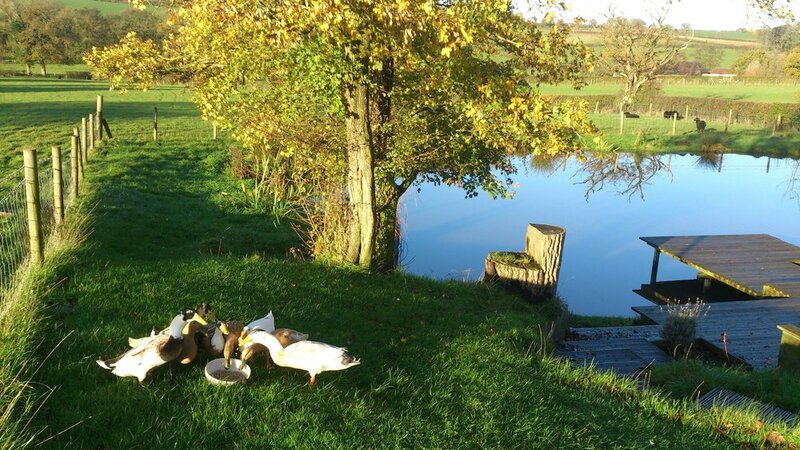 The farm is also a haven for wildlife and you can just relax by the pond or in the orchard where total silence is prevalent, apart from the wildlife. Why not join us for a lambing weekend where you can help out with lambing our Jacob and Black Welsh Mountain Ewes. The month of March is when it happens, the orchard is also brimming with so many beautiful daffodils, the pond is full of frogs spawn and the garden is just starting to wake up. A spectacular month on the farm.